This week StartupRunner announced it's collaborating with Amazon Web Services (AWS), a broadly adopted cloud platform that makes it simple for companies at all stages of business to run sophisticated and scalable applications. NEW YORK, January 26, 2018	(Newswire.com) - This week StartupRunner announced it's collaborating with Amazon Web Services (AWS), a broadly adopted cloud platform that makes it simple for companies at all stages of business to run sophisticated and scalable applications. AWS helps startups move faster, operate more securely, and save substantial costs; all while benefitting from the scale and performance of the cloud. 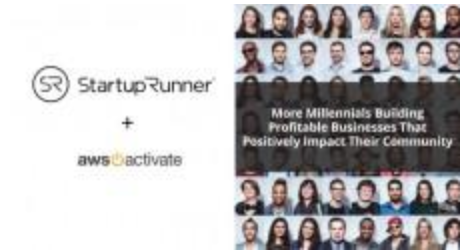 StartupRunner continues to forge partnerships with best in class products essential for Millennials to build profitable businesses that positively impact their communities. AWS eliminates the upfront costs of building and stress around equity splits for founders and employees while ensuring cap tables have an error-free digital record which is essential for early-stage investors like StartupRunner. "StartupRunner looks for partners that share our mission to help entrepreneurs spend less time on managing infrastructure and more time building a profitable business. AWS provides a wide range of low cost, scalable cloud products, and solutions is a natural addition to the value chain of products we're assembling for startups," said Thani Sokka, StartupRunner CTO / GP. One year of AWS Business Support (up to $5,000). Learn more about how StartupRunner can help you start, grow and scale your business at www.startuprunner.com. StartupRunner inspires, educates, equips companies to use the voice of their customers to build profitable businesses that accelerate the Sustainable Development Goals. Mendez, Brazil's leading hot sauce maker, in partnership with New York City's StartupRunner > Foods, launches Mendez Hot Sauce today exclusively on Amazon for U.S.-based Amazon members. StartupRunner and Industry City Join Forces to Empower Millennial Entrepreneurs.